Apparently, July 12th is a really special day for deal lovers. I’ve already reminded you that today is Amazon Prime Day. Well, ebates and TopCashBack want in on today’s action. Both have increased cash back offers that are available today only. When the click strikes midnight, these cash back percentages will return to their regular rates. Yes, they both have offers for Amazon! Today only, ebates added extra cash back to over 100 stores. Highlights include: 7% back at Amazon (select departments receive more or less), 8% back at SAKS Fifth Avenue, Beauty.com, and Bloomingdale’s (5.8% higher than TopCashback), 10% back at Macy’s, 12% back at Loxa Beauty, and 14% back at AHAVA. It will give you a list of all the Extra Cash Back offers at your favorites. My favorites list shows that 38 of my stores are participating in this event. If you have not saved your favorite retailers, there are many reasons to do so, including enticing special targeted offers. I am assuming ebates knows which time zone you’re in, because my offers end at midnight Pacific time. Today only, TopCashback is celebrating summer with their big cash back bonus sponsored by Macy’s. It says that all retailers have an additional 10% bonus added to their regular rates, but a lot of retailers have less than 10% cash back. This probably means not all retailers are participating, but there are great rates from many that are. Highlights include: 16.5% back at AHAVA (2.5% higher than ebates), 13.2% back at Loxa Beauty (1.2% higher than ebates), 11% back at Amazon (select departments receive less -4% higher than ebates depending on category), Macy’s (1% higher than ebates), and Lord & Taylor, and 8.8% at The Body Shop, SAKS Fifth Avenue (0.8% higher than ebates), Beauty.com (0.8% higher than ebates), and Peter Thomas Roth. This serves as an important reminder to have more than one Pay To Shop Program. 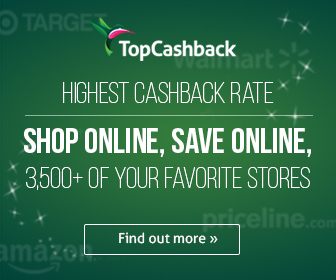 They both have deals for certain retailers that are better than others, but TopCashBack in general seems to have better offers than ebates today. Read all articles regarding cash back. View my main page for the guide map to the site and deeper deal exploration.